For men, use the skate as a training device! The K2 Mach 100 Boa inline skate features a custom fit boot with Boa closure system. Custom Fit means for K2 skates that adjust the interior material of the soft boots at body temperature to the foot. Thus is the entire foot and optimum power transfer is maximized. Boa closure system means an equally strong pressure distribution, no dangling shoelaces and easy handling. Quickly closed by simply turning the wheel - quickly opened by simply pulling the wheel. The soft boot is at the sole firmly with the associated impact plastic produced Cuff. Stability without end. Mach 100 when the cuff is reinforced. High strength training can best be transferred to the wheels. Hi-Lo rail structure means that are built into the rear rail wheels 100mm, 90mm front. 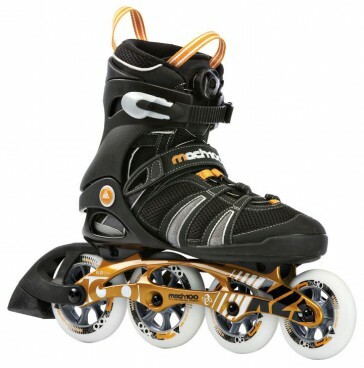 This system was used initially for use in inline skate hockey. The advantage of the frame assembly at the Hi-Lo system is much easier maneuverability and steering into the corners. The track was of course made especially for it, you are not wrong to the front, you still notice the straight-line system. K2 Skates builds the brand Hi-Lo already very successfully for many years in the skates. Security through the 3-fold closure. Is tied to the boat as already discussed with the Boa system. The heel is also equipped with a 45 ° Powertrap held in position. Quite on the upper cuff ratchet strap to the stability above the ankle is attached. The auxiliary loops back on the front cuff and easier on the tongue, the rapid on and off. The K2 sports training wheels with a hardness of 83a are rather harder. 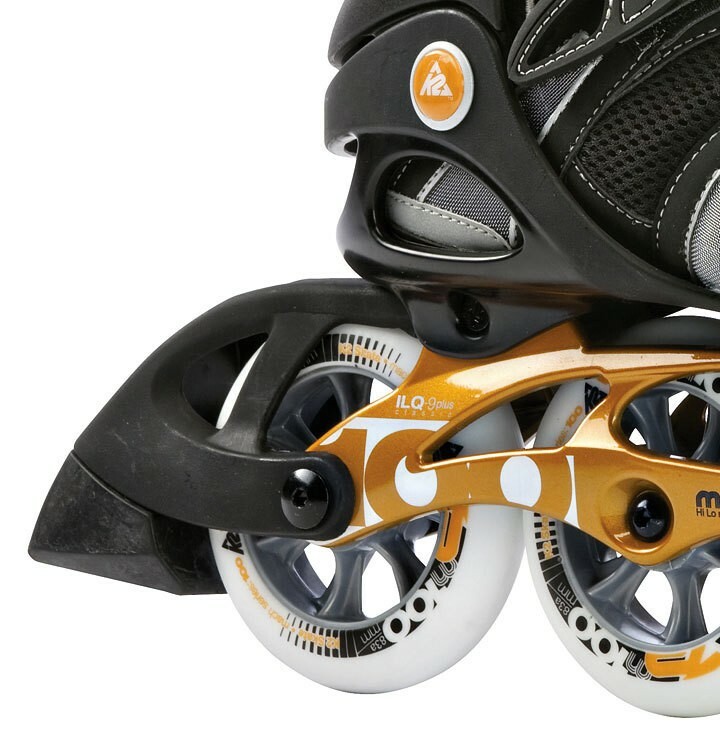 Each two Twincam ILQ 9 Classic Plus bearings per wheel make for a very easy rolling. High speed is a must! Stopping the inline skate right on by a frame-mounted brake with brake pads. Of course you can also easily ummontieren the brakes on the left skate. For our brand K2 inline skates to get for years all necessary spare parts from us. For the cross trainer who wants the performance and heat mold-ability of a race skate; the support and comfort of a fitness skate along with the Boa Closure System. 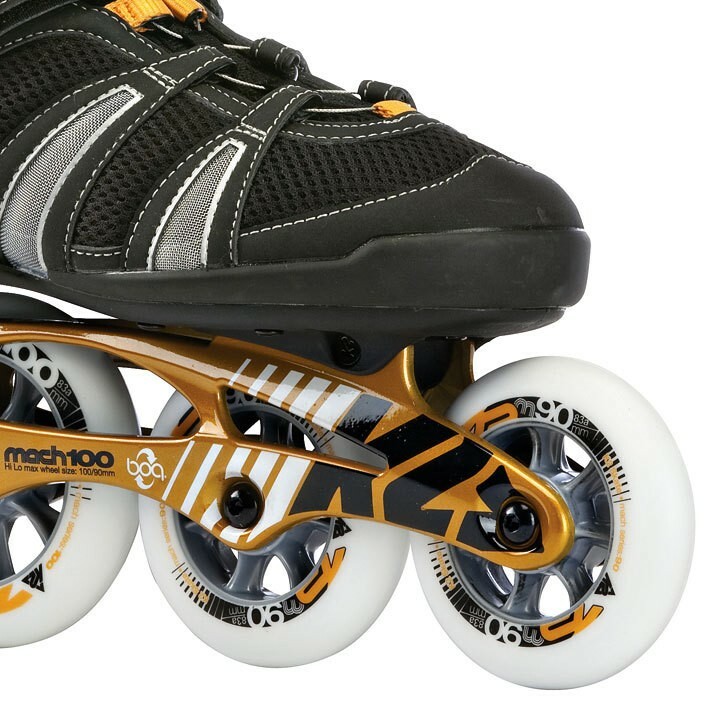 Important-Tipp: Inline skates should be ordered one size larger than street shoes. Do you have problems with the correct selection of shoe size? Send us an e-mail, we advise you!